At the December 13 SGNA Board meeting, Christian Wasilk and Allen Blood, representatives from Turner Construction, presented to the neighborhood their plan for managing the construction site of the Holladay Park Plaza East, a 10-unit apartment building to be located in the area of the current parking lot between 17th between Clackamas and Wasco. It’s scheduled to begin construction on January 9, 2017. Construction activity will start at 7am, not before, and stop at 4pm — including deliveries. Neighbors should contact them with any reports of noise violations outside of this window. 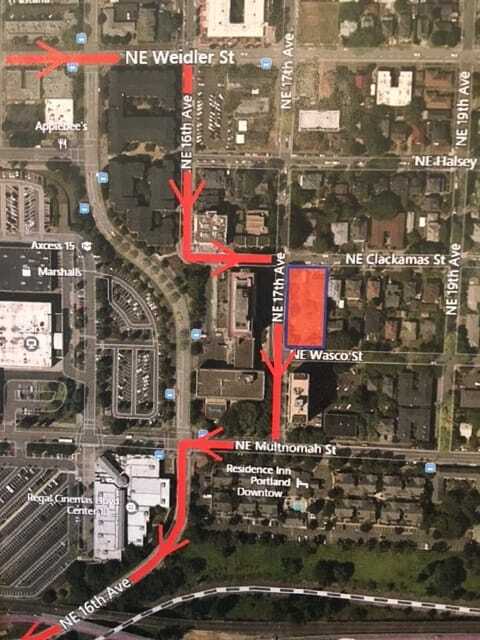 The parking lane on 17th between Clackamas and Wasco will be closed for deliveries, which will take place behind the construction fence. Workers and contractors should be parking at the Safeway parking lot. There will be flaggers to control traffic at Clackamas. Some concern was expressed about safety for cars turning from the intersection at 17th onto Multnomah, since it is difficult to view both sides of the traffic. The parking spot on the east side of 17th closest to Multnomah could be vacated by permit to increase visibility during construction.